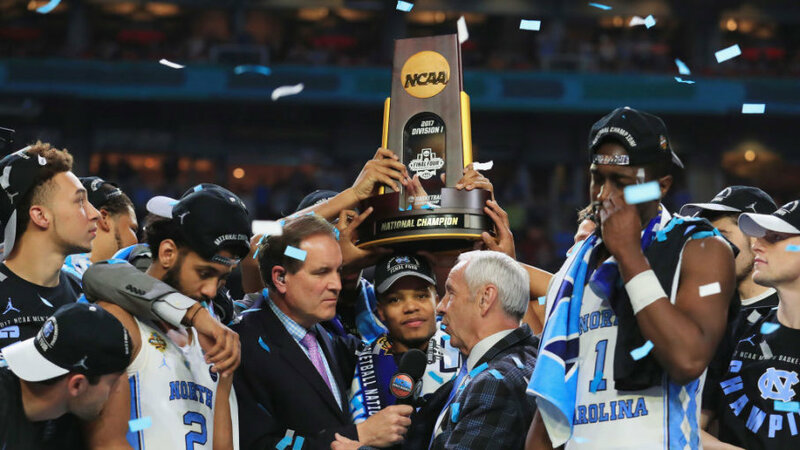 Could North Carolina sweep through the madness again? Depending on your location, the NCAA Tournament starts today right around breakfast, brunch, or lunchtime. Over the next three weekends, (that is if you are a liberal counter and make Thursday part of your weekend) the NCAA field will work its way down from 64 to 32 to 16 to eight, four, two, and one. It is an exciting month of last-second shots, high hopes, and dashed dreams. Some say it is the best extended time of the sports year. Here is our viewer’s guide to what to watch when there is wall-to-wall ball scattered over four different channels. The number to the left of the team name is its seed, and all times are Pacific. There is some coaching intrigue in this game, but it isn’t all on-court intrigue. Richard Pitino coaches the Minnesota Golden Gophers. If that name sounds familiar, you are thinking about his father. Rick Pitino coached Louisville for 17 years until an NCAA investigation into illegal inducements swept him away. Do you suppose young Richard has added motivation to take down the Cardinals? Wouldn’t it be fun if Rick (Sr.) showed up in Golden Gopher colors and sat behind the bench? CBS has the call at 9:15 am. The Wolfpack play in the lightly regarded Mountain West Conference, but some observers believe this is a team that can make a run at Cinderella’s slipper. Before they try on the shoe, though, they have to get past the talented, yet up and down, Gators. Florida has the horses, but does Nevada wield the whip? TNT has the call at 3:50 pm. If you see a pattern developing, then you are a smart cookie. Gildshire likes the 10-7 matchup because some of the best ball in the tourney is played in that get-together. This one has a special attraction because the Terriers are a complete unknown at this level in the tournament. They could be this year’s 6+ seed to make it past the first weekend, but they could be one-and-done? CBS has the call at 6:40 pm. Let’s start Day Two with a Hail Mary for an upset. They say that matchups make fights, so you should know the Anteaters might have the matchup of backcourt play and power up front to give Kansas State a run for their money. It may come down to UC-Irvine’s ability to shoot the three, but if they can, you will be glad you chose this game. TBS has the call at 11 am. We had to choose one 12-5 matchup because a 12 has so often taken down their perceived betters. This could be one of those triumphs by the lesser over the favorite. Las Vegas has the Badgers as a one-point favorite, so you know the gamblers are giving Oregon a chance. Are they fools gold or the real deal? TBS has the call at 1:30 pm. Two good games on the slate to close out Round One. If you haven’t seen Central Florida’s 7’6″ center Tacko Fall play yet, you might choose this one. But, if you have seen Tacko Fall, you might choose to watch the Hokies and Billikens. Saint Louis is as scrappy as anyone in the field, and Virginia Tech is the chic pick by some to make the Final Four. Enjoy the games, no matter which teams you choose to follow. If your favorite team is in the field, we hope they reach as high as you feel they should go. Let the games begin, because we can’t wait!